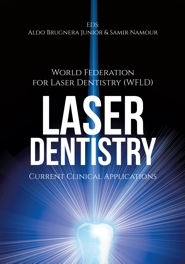 Laser Dentistry: Current Clinical Applications by the World Federation for Laser Dentistry (WFLD) is a comprehensive guide the state of the art, principles and practices of laser dentistry. This collection of articles were compiled by Professor Aldo Brugnera Junior DDS, MS, PhD and Professor Samir Namour, DDS, MS, PhD, is written for all those interested in the clinical use of laser technology related to dentistry, research, development and biology, and medicine and surgery. Topics include: Laser, history and physics; Laser periodontics; Laser applications in implantology; Laser in oral soft tissue surgery; The laser management of oral leukoplakias; Treatment of bone necrosis caused by biphosphonates, Treatment of vascular malformations; The role of lasers in caries prevention; Dentinal adhesion and cavity preparation; The power of the bubble Erbium laser generated cavitation; Pre-emptive dental anaesthesia by Nd:YAG photobiomodulation; Non-invasive diagnostic methods using lasers; Clinical use of laser/LED phototherapies; Laser photobiomodulation (PBM) with low level laser therapy (LLLT) in esthetic dentistry; Laser phototherapy & oral mucositis; Lasers in dentin dehypersensitivity; Photobiomodulation therapy and dentoalveolar derived mesenchymal stem cells; Dental bleaching without gel; Hard tissue modification, cavity preparation and caries removal using erbium lasers; Laser safety; Optical fluorescence; World Federation for Laser Dentistry (WFLD) progress and history. The WFLD is non-profit organization dedicated to the exchange, advancement and dissemination of scientific knowledge, related to the use of lasers for application and research in the oral and dental environment and members include dentists and oral surgeons from all over the world. Membership is encouraged from all those interested in research, development and use of laser technology related to dentistry, biology, medicine and surgery, to develop lines of communication between all phases of laser technology with the objective of improving standards in laser dentistry, furthering education, research and development and providing meetings for the exchange of ideas and methodology in the field of laser dentistry.